The new beds out front are beginning to fill out nicely. 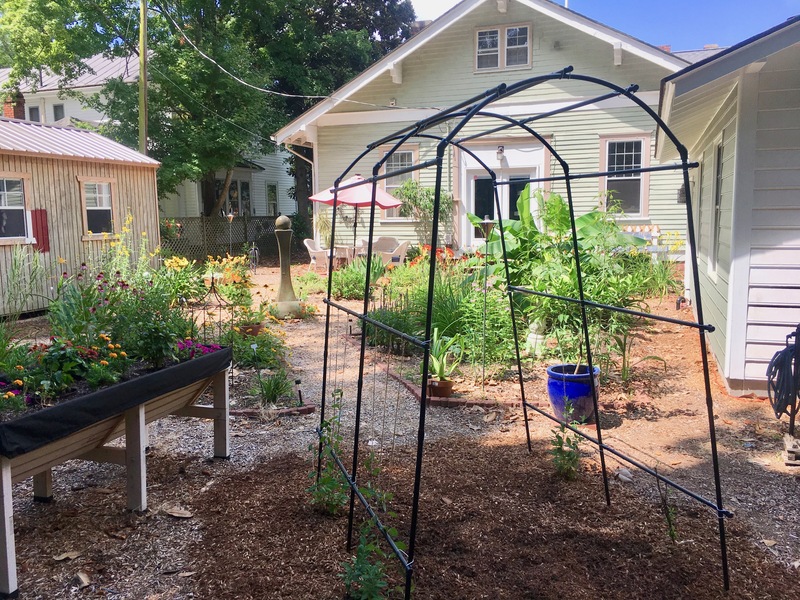 I already see where I may need to do some adjustments by the end of the season and have come up with a few alternate ideas for plantings, but over all I believe I am pleased with the outcome. Weeds, as usual, are a problem. While many of the plants seems to stress in the sweltering heat we have been having, the weeds on the other hand seem to be reveling in it! It has been too hot so spend much time weeding, but I do as much as I can in the early morning hours. 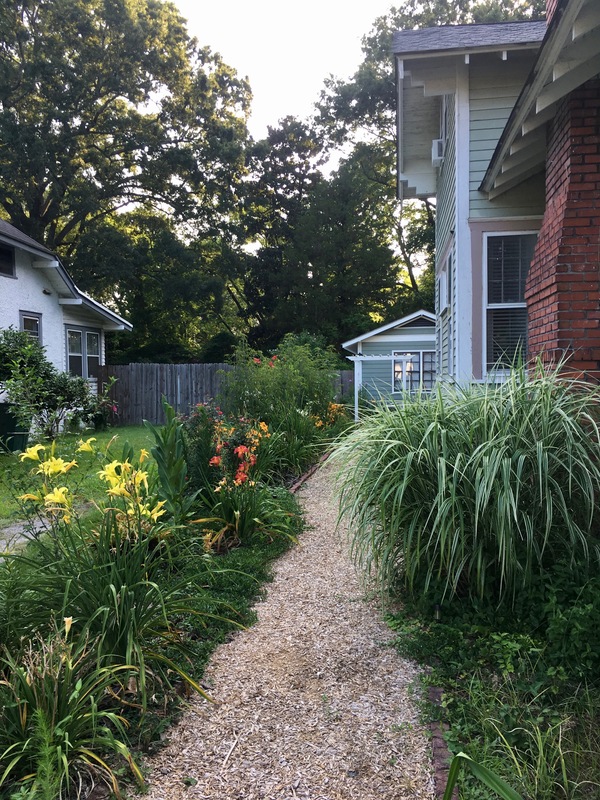 The side bed is the worst in terms of weeds taking over. It is embarrassing! This lovely picture of the path going back to the cottage with dark green plants cascading over the edging bricks. Those are weeds! I’m so embarrassed. Quick, look at this! Yes, lovely grape vines. 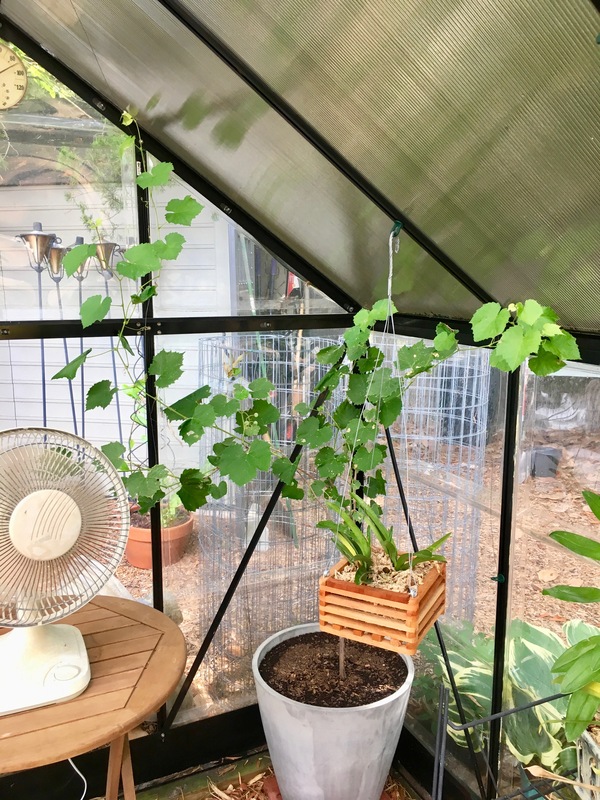 I have two potted grape vines that were originally on the trellis outside the greenhouse. After last season’s decimation of grapes by birds and squirrels I decided to try them in the greenhouse. They seems to be doing fine and are starting to climb the wire guides I put up for them along the back wall and along the ceiling. I will keep them trimmed and focus on two cordons for each potted plant. I probably should remove the grapes that are on it now to focus on vine growth, but I would like get a few grapes before the year’s end since I was robbed of them last year! In the spring we moved the raised bed from behind the cottage to a more prominent space behind one of the beds in the centre of the back garden. The idea was to use it as a vegetable patch, but then I realised I had made the raised bed of pressure treated wood, which you cannot use for growing food. 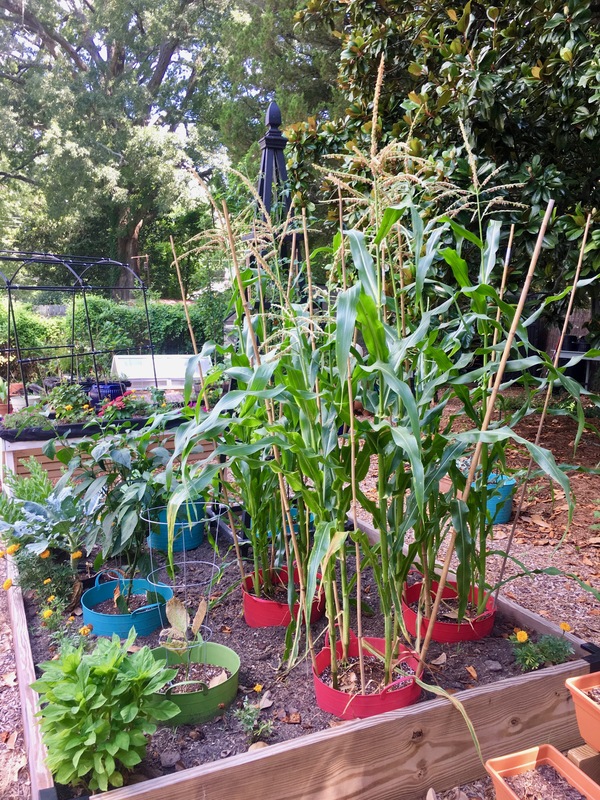 To negate this problem I simply planted some vegetables in containers and placed them in to the raised bed so to keep them from toppling over during our crazy wind storms during the season. Vegetable plants seem to do very well in these containers. I used this method four years ago at the other house and the produced quite a lot. I think this may be because of the concentration of water going straight to the roots and not spreading out in the dirt. Last weekend I finally tore down the old falling apart trellis (Arc de Jardin) and put up this new one in its place. I am training honeysuckle to climb it. Hopefully, one day it will be covered in fabulous vines! Thanks for sharing the idea of leaving some vegetables in their pot when planting them. I recently bought a tomato vine that was 3 feet tall, took it home and out of the container and planted it. It suffered transplant shock and was a hot mess. I think it would have been best if I had left it in its container. I did transplant the young vegetables from their small container to larger ones. The container I use are not actually pots, but these rubber buckets that I drilled holes for drainage. However, I never transplanted a 3′ tomato vine before, so I am not sure it would have faired better being moved into a larger pot. Though I do think planting in a pot collects the water right to the roots, which important for a water loving vegetable like tomatoes. This is great. 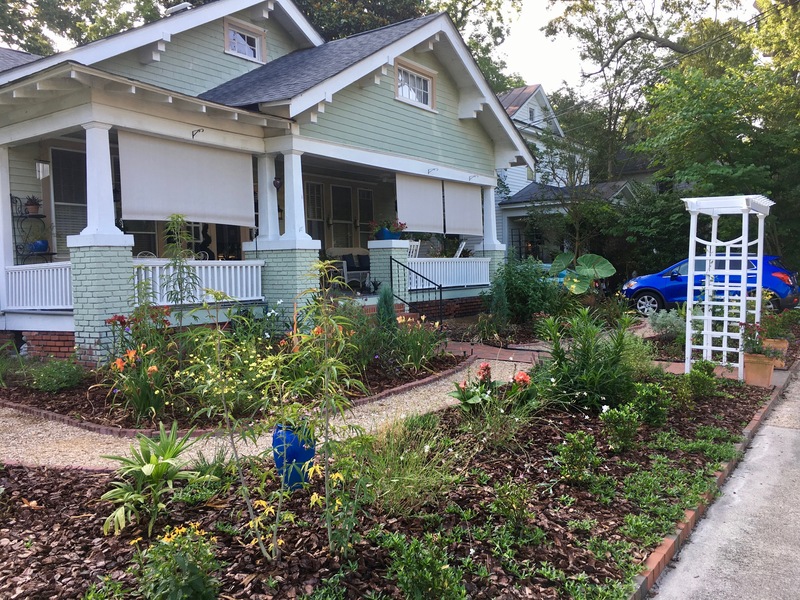 It’s my wife and I’s dream to have a front “lawn” that isn’t grass at all, but like this. Good ideas! Yes, lawns are such a waste. Thanks for stopping by!